Kelly Catlin (November 3, 1995 – March 7, 2019) was an American professional racing cyclist. She rode for UCI Women's Team. Catlin won gold medals in the women's team pursuit at the 2016, 2017 and 2018 UCI Track Cycling World Championships. She also won a silver medal in the same event at the 2016 Summer Olympics. Catlin was born in St. Paul, Minnesota. She was a triplet. Catlin killed herself on March 7, 2019 at Stanford University in Stanford, California. She was 23. Months before her death, she had a concussion. ↑ "Kelly Catlin". Cycling Archives. Retrieved March 3, 2016. ↑ Soladay, Tom. "2019 men's and women's rosters". Circuit Sport. Archived from the original on January 22, 2019. Retrieved February 25, 2019. ↑ Dreier, Fred. "Kelly Catlin passes away at 23". VeloNews. Retrieved March 10, 2019. ↑ Boren, Cindy (March 10, 2019). "Kelly Catlin dies: U.S. Olympic cycling medalist was 23". The Washington Post – via The Denver Post. ↑ "U.S. Olympic medalist Kelly Catlin dies at age 23". Reuters. March 10, 2019. Retrieved March 11, 2019. 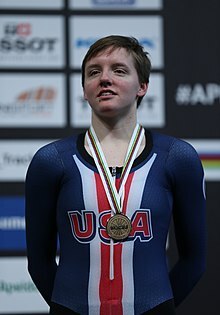 Wikimedia Commons has media related to Kelly Catlin. This page was last changed on 29 March 2019, at 13:25.